I’m really pleased with how it turned out………. 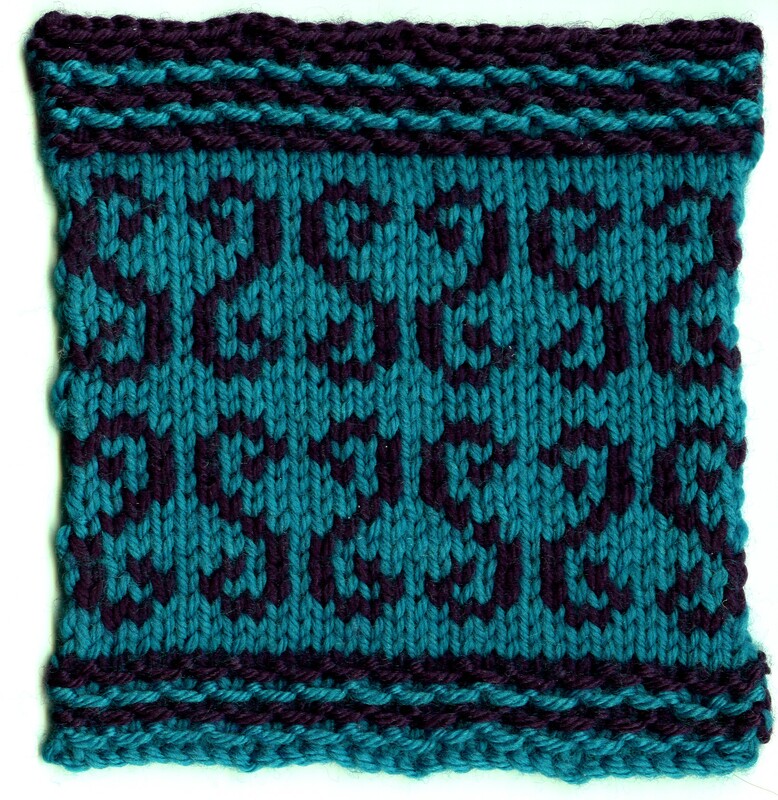 ….. and it’s lovely and warm thanks to the combination of alpaca yarn and the stranded colourwork that creates a thicker fabric. 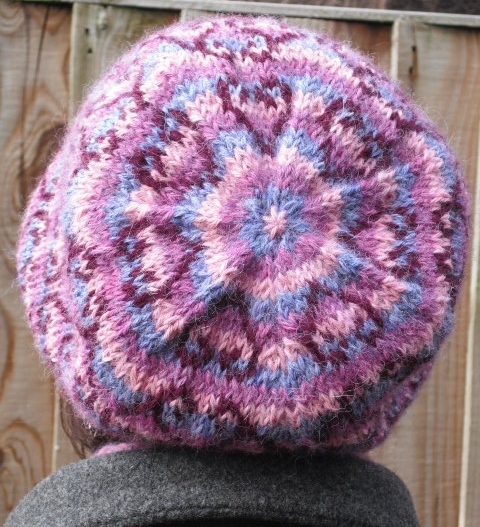 You can find my project on Ravelry here. So what next? I’ve finished three WIPs since I started my WIP Amnesty (four WIPs left to finish), so I think it’s time to start a new project (although I have been working a little bit on a jumper I’ve had a on the needles for about a year) but what should I knit next? Any ideas? I need to use up some of my stash……..
Once again it’s been mad – one day I will have some time to blog consistenly/rest/socialise/knit something I get to keep/do Christmas shopping in something other than a blind panic (ie yesterday afternoon)! However the considerable upside of all this is that I’ve got a couple of exciting things that I will be able to tell you about next year. Yay! But not yet. If you know me, then you also probably know that I have a weakness for hats. I also am a bit of a magpie, especialy where beads are concerned, so what better way to combine the two than in a beaded hat? I had a skein of pale icy blue Manos Silk Blend (shade #7338 Aquarius – not usually my sort of colour, but perfect for this design) in my stash, which I bought with the idea of swatching it with pale sparkly beads, keeping to the icy theme, and an idea for an unusual way of encorporating beads into one of my favourite stitch patterns. 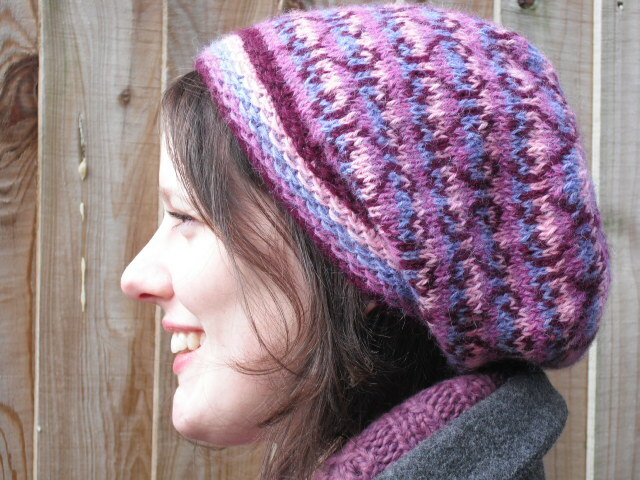 So after a bit of swacthing and a sketch, I sent it off to the lovely Kate at Knit Now, and it got accepted – yay! So here it is – and what else would I call it but Glacier? 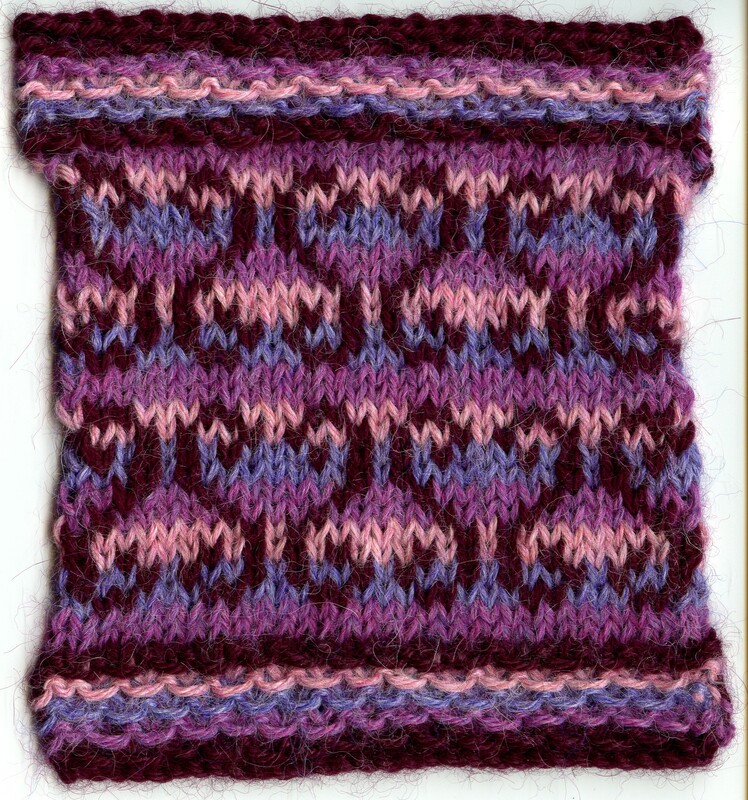 Stitch pattern detail – I love these little mock cables – so satisfying to knit! …..and the pattern comes together satisfyingly at the crown. 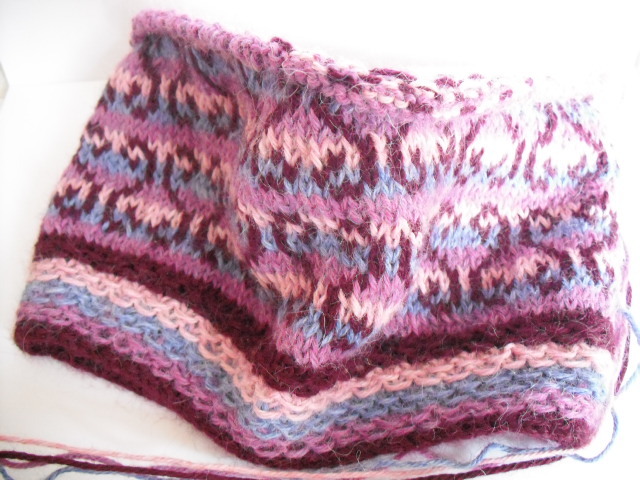 Back detail – I love the convergence of the pattern! 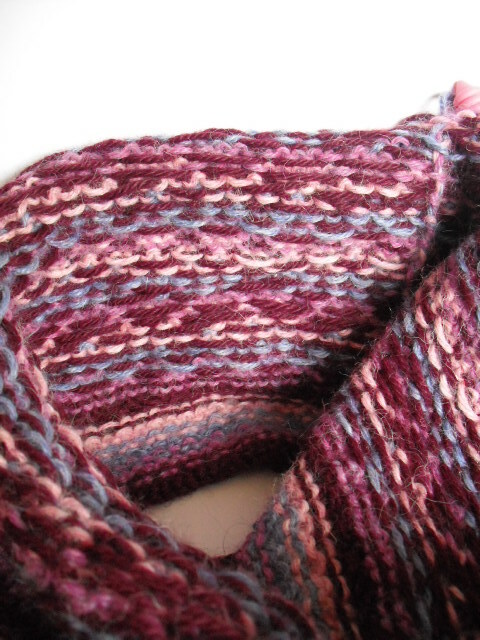 If you fancy giving Glacier a go, remember to choose a yarn with a high wool content. Manos Silk Blend may have silk in it, but it is 70% wool – really important for this pattern, as you need the hat to keep its shape under the weight of the beads (the hat is also seamed to help keep it from stretching, and all this means that it keeps its shape perfectly). Talking of beads, I got mine from Debbie Abrahams Beads, (size 6 clear beads) I chose clear silver lined beads, but there are lots of other colours to choose from. I’m really tempted to make another version in brighter colours – maybe with more than one colour of beads….hmmm………no one minds if they don’t get a Christmas card or gift do they?! 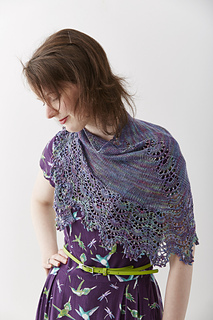 If you want to get your hands on this pattern, and lots of other lovely patterns, Knit Now Issue 16 is in the shops now, and you can also find it here at Stash! P.S. 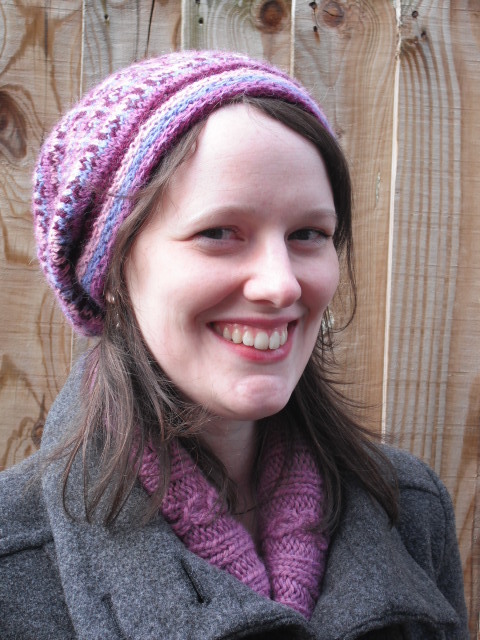 Yes, I am also on page 3 of Knit Now – my answer to the designer question got picked 🙂 yay! (and no it isn’t that sort of page 3 – thank goodness)!